Brandenberry Presents Colebrook Dining Collection, a beautiful collection of dining furniture. The Colebrook design is rooted in the classic Mission style. Therefor featuring subtle curves and rich wood inlays for an elegant accent. 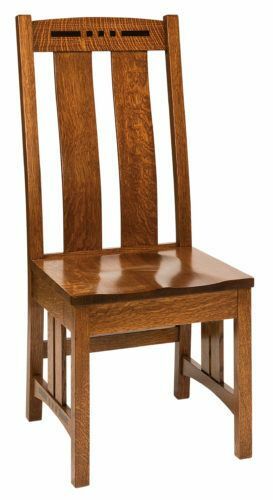 The Colebrook Dining Chair (pictured here) boasts sturdy wood slats and a rich wood finish. In addition, a variety of custom options allow anyone the chance to optimize any of the Colebrook pieces to meet their exact preference. These options include wood species choices, stain and paint options, and wood, fabric or leather seat choice. Browse more of Brandenberry’s Colebrook pieces and choose these beautifully-crafted furnishings for your home! The Colebrook Dining Chair features a classic Mission design.